… close to Hamburg, this oak tree almost had suffered a sad fate. After a storm damage it nearly was cut down completely. 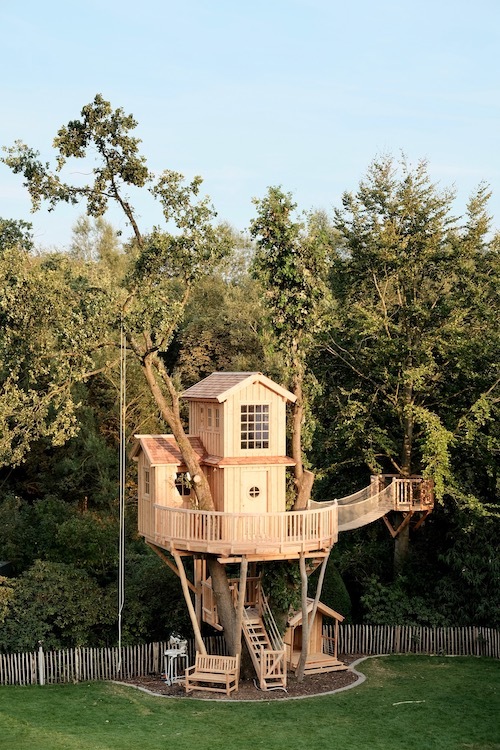 But the owners decided to save it: the five-person family endowed itself and the brave oak tree with a true adventure-treehouse! 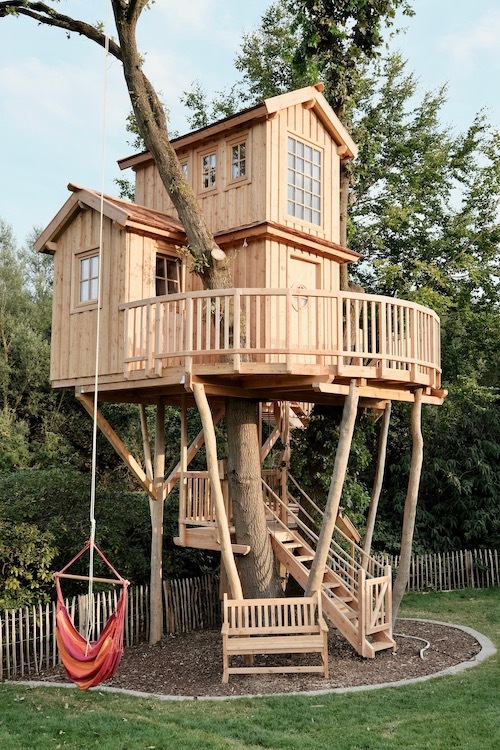 Now this two-storied treetop nest is sitting on the double-stemmed tree at 14 feet above ground. Unplaned siding and cedar shingles covering the roofs provide for an elemental look. 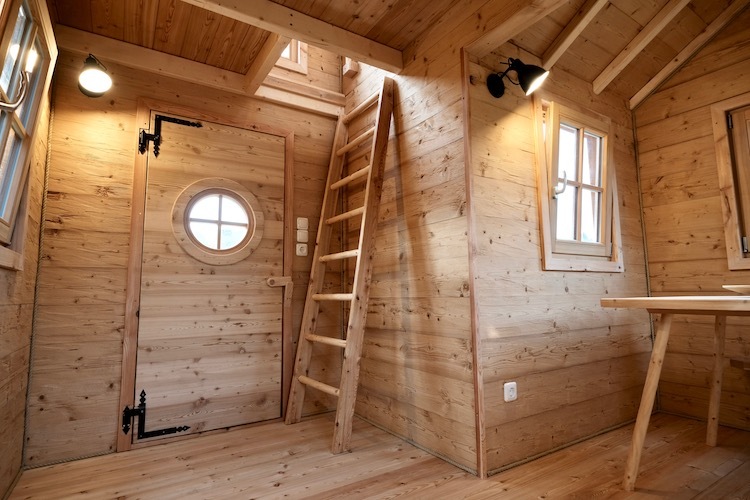 Inside, the insulated walls are covered with fine nostalgic spruce wood boards. 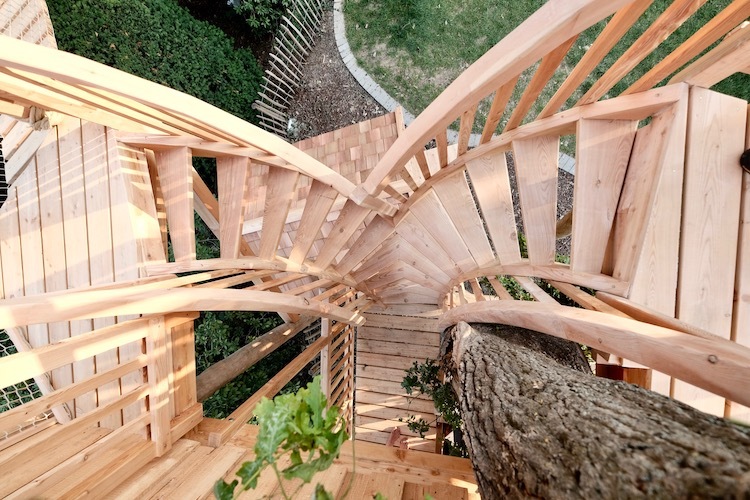 To relieve the tree of some of the treehouses weight, we supported it with six additional locust tree trunks. After completion the three kids storm their new magic kingdom with shining eyes. 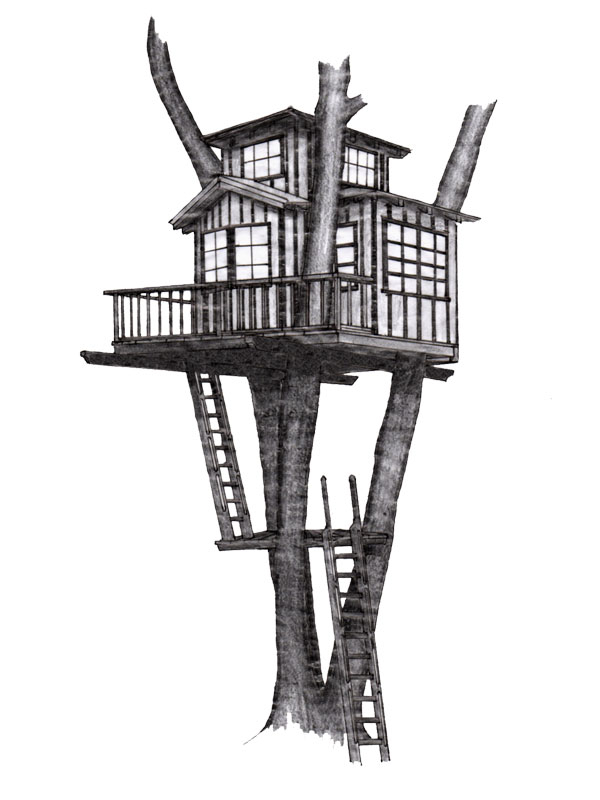 They dash over the stairs which runs below the platform to the mind-flipping spiral staircase, the highlight of the treehouse. A little bit it resembles the curved spiral staircase of the Livraria Lello in Porto, right? Catlike it nestles around the tree to the left and the right up to the platform. Up there the kids have to decide. Straight across the 16 ft. suspension bridge to the crows nest? To the corner bench with a table to paint, play or eat on? 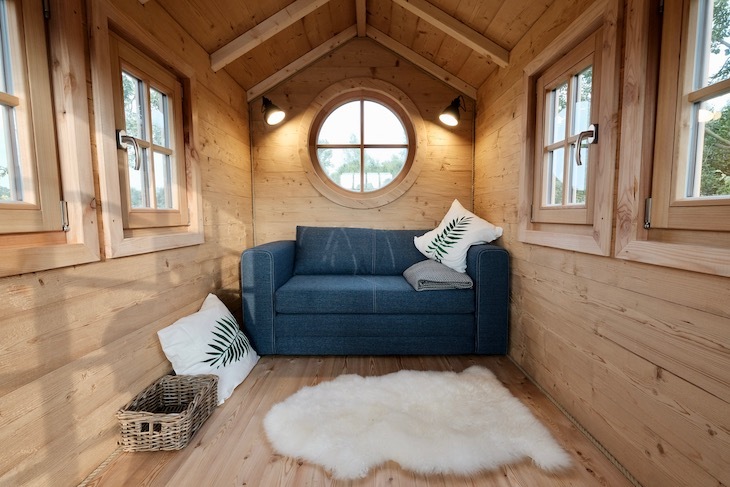 Or right to the second floor with its cozy reading nook and sofa bed? 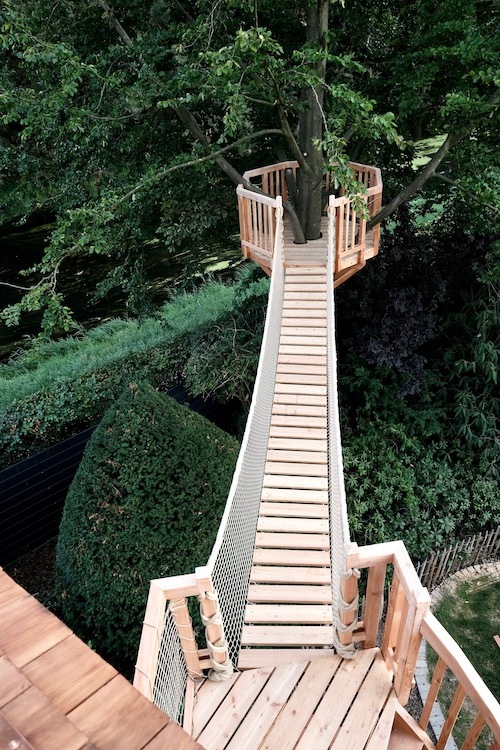 Soon there will also be a long stainless steel slide to leave the treehouse. If fast exit is required. 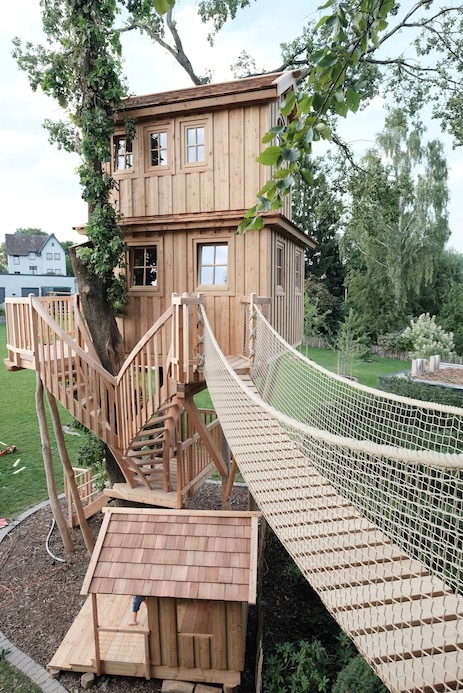 Or if one wants to chase one another all around the treehouse. Which occasionally happens. 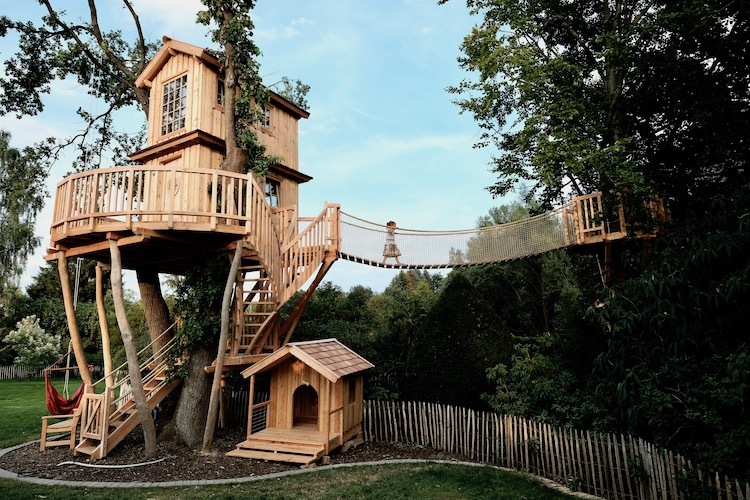 While the kids explore the treehouse, some munching is audible from the dog-loft down below. The two Golden Retriever dogs curled up there already. And the parents? They are astonished!